What a wild day out at Lacy Island yesterday, wind howling 30 plus, rain sideways, every third wave over the rail, yes I had two life jackets on. Was it worth the pounding my crew was taking? 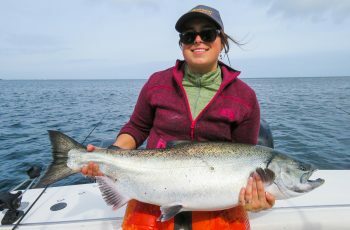 Well, we had a limit of chinook to 25 lbs and a limit of coho, including two thirteen’s, a fourteen and a fifteen. 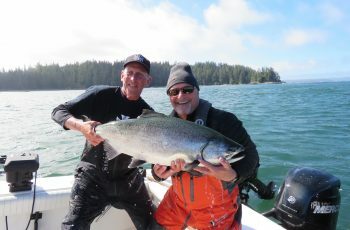 We released countless coho, all fish taken on plugs. At times the towering waves were breaking so close together, bouncing off Lacy and beating us a second go around. Most of the morning we fished one plug off a downrigger, which was hit every couple minutes. My crew of Tim Brown and Mario Distefano held it together, and as we were the only boat west side, we loaded up! What a beating, but wow, Lacy was loaded! The Marine Mechanic Terry, or Kingpin as we call him, poured over my boat, got her back in top shape for today. Korey had to rebuild my riggers, the salt water bath blew out the spring and brake pads, Korey told me to move next time my riggers are under water ha ha. Today saw calm seas, Lacy was flat, with a ripping tide and full of kelp, rats! The whole fleet moved in at lunch, I had Dave Golton aboard along with Eric Gerow and Dan McCaw. We started slow, but as the boats pulled out things started to happen. I switched to plugs, good idea! Now I could buzz around avoiding kelp and skiffs, rip through bait balls and start grabbing them. 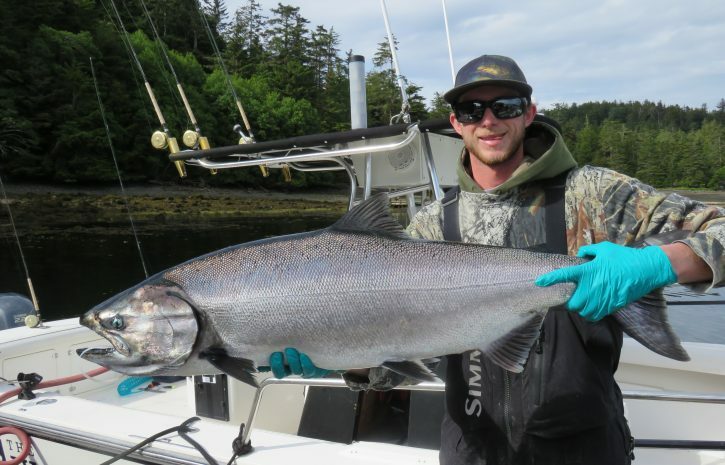 Our first spring was a 26 lber taken 50 feet off the rigger on a 500 tomic, Dan grabbing this one. 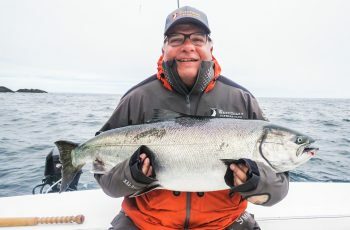 Not half an hour later a 30 lb tyee assaulted our tomic plug, this one angled by Eric…what a nasty mean fight on this fish. Not happy with a large hook through his beak! Another few minutes and Dave lunged for a buckled rod, this one a 23, we laughed, zero fight, this fish committed suicide! What a great start to they’re trip, three nice kings in short order. 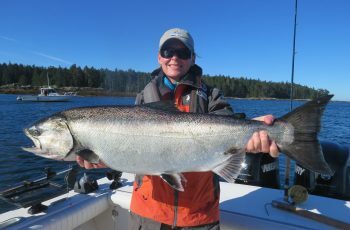 We grabbed nice coho as well, averaging 11 lbs today. 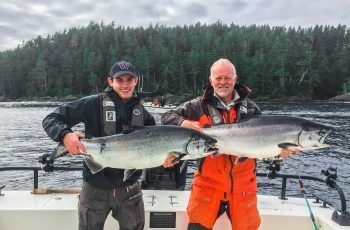 Korey fishing with Phillipe Archambault and his father smacked a 31 as well out there. They had a nice tote, rivaling ours, three great springs, all bait fishing deep. Korey was on them all afternoon, fishing deep to avoid coho! Gary Bemister was proud of his self guided 31 as well, nice king!